As teenagers, it never occurred to us that the boat might fill with water, and we might have to swim back to shore. It also never occurred to us that when the sun went down we would get completely lost in the woods along the river. All of a sudden a flashlight shined right into my face. We stood in a row, shivering and wet. And yes, I felt like a criminal, though I hadn’t done anything wrong. Years later I realize that following some boys into the woods in a deserted area was probably not a good idea. And not just because we could get lost in the woods. 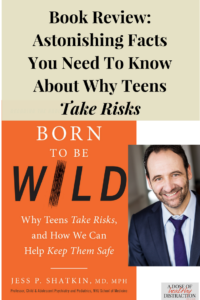 Teenagers are wired to take risks, but there are things we can do as parents to keep them safe. Jess P. Shatkin, MD, MPH has been doing groundbreaking research into the inner workings of the adolescent brain. This is information all parents of teenagers need to know. In fact, if you were to ask a teenager how likely they are to be killed in an accident, they would tell you that the probability is much higher than it actually is. And this applies to kids with ADHD as well. I asked Dr. Shatkin. Below is his response. Actually, this finding applies to everyone. People affected by ADHD are generally more impulsive, but the cognitive or thinking parts of the brain are the same for all kids when it comes to thoughts about invincibility. So, if you ask someone with ADHD about their vulnerability to getting hurt from engaging in various risky behaviors, you’re asking them to make a risk assessment, and they too will way over-estimate the chance of a bad outcome. Still, however, they may engage in the risky behavior, even if they believe the risk is high. And this is also true for all adolescents, but perhaps even more so for those with ADHD because of their tendency to be impulsive. In humans, the prefontal cortex, which controls planning, organization and other executive functions is later to mature. On the other hand, limbic structures mature earlier in children. The limbic system controls emotions and actions. So I asked Dr. Shatkin how conditions like ADHD factor into all of this. How exactly does a neurological condition like ADHD, factor into risk-taking behavior? Is it all about dopamine? norepinephrine (another neurochemical) circulating in key parts of the brain involved in maintaining attention and focus. But we don’t know that kids with ADHD or other psychiatric conditions for that matter have different amounts of dopamine or other neurochemicals in the brain that impact their risk taking behavior. I should also say that there are a few known changes in dopamine receptors (notably D4 and D5 receptors) that are associated with some but not all cases of ADHD. Since this finding is not present in most cases of ADHD, however, it does not explain the risky behavior that we often observe. Dr. Shatkin goes on to offer some advice about reducing risky behavior. As I wrote a while back, authoritative parenting is so important to developing a working, collaborative relationship with your children. As in, authoritative parents are better at balancing discipline and reward. How would you start using mindfulness with a child that was highly resistant, defiant even? This is a great question. So much of my work is about overcoming stigma and resistance. Sometimes it comes from the children and adolescents, and sometimes it comes from their parents. In either case, we do best when we are patient, supportive, and good role models. Forcing anything rarely works with adolescents. I offer up the evidence, which favors the use of mindfulness techniques. Although that helps, I often find that teaching a bit of neuroscience is also helpful, even if briefly. For example, we know that engaging in mindful meditation for even just a few months results in measurable and beneficial brain changes that lead to improved concentration and memory with lowered anxiety. When people see pictures of the brain and the kinds of changes that happen, it makes it seem more real and becomes more motivating. And then, as I said, I try and role model. I might say something like, “I know that sitting here and doing some deep breathing seems like a waste of time, but I really want us to try it together. Let’s practice for just 10 minutes.” Sometimes, I find that my willingness to jump in with two feet aligns me with kids even more. And other times, I can show them that mindfulness can happen all sorts of ways – we can take a mindful walk, have a mindful snack, listen to something together in a mindful way, sit mindfully on the swings in the park, or even practice biofeedback. These are all hooks that I sometimes use to encourage kids to give it a try. Almost without fail, they tell me that they feel calmer afterwards, and more focused, even those kids who were resistant at first. This is a well-written very informative book about how the mind of a teenager really works. I would recommend this to any parent of a teenager who is interested in reducing their child’s risky behavior. Dr. Shatkin was very generous in answering my questions, even the ones that were a bit off-topic. His work is interesting and extremely beneficial to parents. I will be purchasing a few copies of this book for parents in need. Jess P. Shatkin, MD, MPH has extablished himself as the go-to expert on this topic. Here is an affiliate link to Born To Be Wild. Click here for my full disclosure.